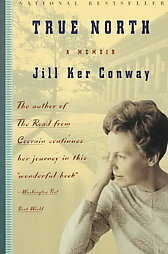 True North by Jill Ker Conway is the continuation of her story after she emigrated to the U.S. After reading The Road from Coorain, I wanted to read about the rest of Ker’s life. I am sorry to say I was somewhat disappointed in the second book. The tone seemed very different and I felt the story was weighed down by long passages about women’s rights which distracted me from Ker’s life story. I recognize her life, work, and the times in which she lived centered on this issue, but I had trouble wading through it. It was a bit too academic for me and I did not feel Ker’s heart in the story as much as I did in the Coorain book. All in all, I am glad I was able to read more about Ker’s life and admire all she accomplished in her life. This entry was posted in Uncategorized and tagged Australia, Books, Harvard, Jill Ker Conway, memoir, Smith College, True North, Women's lib. Bookmark the permalink.